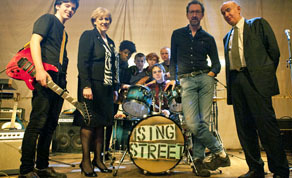 ‘Sing Street’ has been described as ‘a semi-autobiographical tale inspired by the filmmaker’s love of music’. Set in 1980s recession-ridden Dublin, it tells the story of a fourteen year old named Cosmo who finds life at home difficult. He decides to forms a band with school mates, whom he writes songs and shoots videos with. When family trouble strikes, he runs away to London with his fifteen year old girlfriend who aspires to be a model. Aiden Gillen Joins Maria Doyle Kennedy and Jack Reynor in John Carney’s Sing Street’.